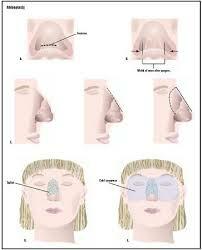 Rhinoplasty is the medical term for a nose job. it is done to reshape the nose in order to make it larger or smaller, reduce the angle of areas of the nose or correct bumps and other blemishes on the nose the individual might not be happy with. In order to do this, incisions around the bone and cartilage supporting the bone is made, typically on the inside of the nose in order to prevent any major scaring, so really the individual is just left with bruises after the completion of the surgery. In order to provide the required look, cartilage and bone is either removed or added, either directly from another area of the body or from a synthetic filler. After the surgical procedure, an individual typically has a rather puffy face, especially around the eyes and nose, which is going to remain swollen for several days. Generally, it is going to take upwards of two weeks for all of the swelling and bruising to improve. During this time, it is important to keep the head elevated, especially for the first several days. There are some minor risks with the procedure, but generally speaking, most people do not suffer any sort of major problems. These minor concerns include bleeding around the nose, injuries around the septum, plus skin problems with tissue breaking down from the bandaging applied to the area. Some infections and nasal blockage can occur as well, although these are not typically an issue either. You can either be put under during this procedure or only use local anesthesia. Local anesthesia is less expensive than being completely put under, but you do have to deal with the sounds of your bones and cartilage being sawed through, which might be enough to make someone woozy and light headed.